Los Angeles native Archie Wilson was a 1942 graduate of the city's Franklin High School (where he also starred in football and was a first-team halfback in the city's All-Northern League) and spent three years at the University of Southern California. In 1951 and 1952, he played outfield for three different teams in the major leagues: the New York Yankees, Washington Senators, and Boston Red Sox. Before he could begin to consider professional baseball, there was the matter of the Second World War to address. Wilson served in the United States Navy 1943-45. His first year in professional baseball was 1947, when he played for the Ventura Yankees in the Class-C California League. Wilson was signed out of U.S.C. by veteran New York Yankees scout Bill Essick,2 whose son, Doug, was a pitcher on the same Trojans team. Wilson appeared in 90 games and hit for a .325 batting average. His best day was probably a five-hit game on July 3, the last hit being a 10th-inning double that gave Ventura a 10-9 win over Fresno. Wilson was right-handed, stood 5-foot-11, and was listed at 175 pounds. In 1948 he played in British Columbia for the Victoria Athletics and appeared in 159 games, homering 24 times and batting .369. He was named to the league All-Star team and led the Class-B Western International League in several categories: batting average, RBIs (132), base hits (244), triples (26), runs scored (137), and total bases (408). In both 1949 and 1950, he played winter ball in Cuba for Marianao, managed by Dolf Luque. Wilson started the 1951 season playing in the Pacific Coast League for the San Francisco Seals and hit .381 in nine games, but on April 12 he was reassigned to the Buffalo Bisons (International League). In 151 games for Buffalo, he adopted a new batting stance suggested to him by Lefty O'Doul during his brief time with the Seals.4 He hit .316, homered 28 times, and drove in a league-leading 112 runs. His 191 base hits also led the I.L. He was voted league MVP, and also an all-star. On September 16, his contract was sold to the New York Yankees. On September 18 the Associated Press announced that Wilson had become engaged to Sybil Ann Volk of Niagara Falls, "a former ice follies skater. "5 On that same day, Wilson had his major-league debut at Yankee Stadium. Manager Casey Stengel inserted him as a pinch-hitter to lead off the bottom of the eighth. What had been a 1-1 game had turned into a rout as the visiting Chicago White Sox had scored six times in the top of the inning. Wilson grounded out, 6-3. In Boston on the 22nd, Wilson pinch-hit in the eighth. Again he hit the ball to the shortstop, this time a fly ball. He got into two more games, both when the Red Sox were visiting New York. On the 29th, he pinch-hit in the eighth again, and was hit by a Mickey McDermott pitch. A few moments later, he was erased on a double play. In the fourth inning on September 30, the last game of the season, he replaced Joe DiMaggio in the lineup, taking over for Mickey Mantle in right field as Mantle moved to take DiMaggio’s place in center. He hit into a double play his first time up, when a baserunner didn't get back to first base on time following his fly ball to right field. He grounded into a double play his only other time up. Seven months later to the day, he finally got his first major-league base hit. He had hit exceptionally well in spring training and made the Yankees. In the top of the 10th during the April 24 game in Boston, he stepped into the batter's box for the first time in 1952, and flied out to right field. The Red Sox won on a bases-loaded walk in the bottom of the 11th. Back at Yankee Stadium on April 30, the St. Louis Browns leapt out to a 4-0 lead, and they added a fifth run in the second. In the bottom of the second, Mickey Mantle was on second when pitcher Vic Raschi was due up. Sitting on the bench, Wilson heard Stengel yell, "Get the kid from Utah up." Living in Nevada at the time, he stayed put until Tommy Henrich poked him. "I'm from Nevada," Wilson told Henrich. "It doesn't make any difference to Casey," Henrich replied.6 Wilson singled to left field scoring Mantle. Three days later, he was traded to the Washington Senators. The May 3 trade sent Jackie Jensen, Spec Shea, Jerry Snyder, and Wilson to Washington for Irv Noren and Tom Upton. The Senators put him to work, both in center field and left field. He appeared in 26 games over the next month, but only batted .208. He did drive in 14 runs. On June 9 he was traded to his third team of the season in less than two months, this time to the Boston Red Sox for another right-handed outfielder, Ken Wood. He played some right field, and a couple of games each in left and center, but only got into 18 games in all. When he did, he finally showed a better bat, hitting .263, but only drive in two runs. One was on a game-winning hit on July 12 against the Tigers. He trained with the Boston ball club in the spring of 1953 but pulled a muscle when his spikes caught as a baserunner while working on pickoffs. A month later, still not healed, he was optioned to Baltimore and spent the year playing for the minor-league Baltimore Orioles. He played well, batting .301 with 79 RBIs. In December 1953, the Red Sox sold his contract to Toronto (International League). Wilson spent most of his next six seasons playing for the Toronto Maple Leafs, his average more or less hovering around .300 until 1960, when he only got into 52 games, hitting .223. He worked as a player/coach for manager Mel McGaha. 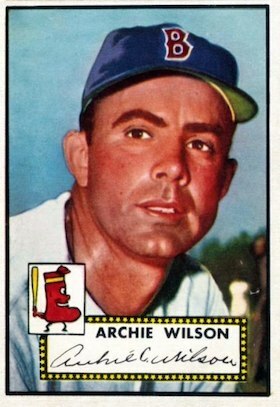 There was a time in 1957 when he spent most of the season with the Charleston Senators (American Association) before returning to Toronto in mid-August. Wilson managed in the Washington organization 1961-63. In 1961 he worked in the Class-D Alabama-Florida League as skipper for the Pensacola Senators. He put himself into 16 games, playing first base in 12 of them, and batted .350. They were his last professional baseball games as a player. In 1962 he managed the Raleigh Capitals in the Class-B Carolina League and in 1963, the league now a Class-A league, he managed the Peninsula Senators in Hampton, Virginia. After 1963 he went on to other things, working as a traffic manager and purchasing manager with the Fruehauf Corp. He retired from there after many years. He attended Westminster Presbyterian Church, and was both a Rotarian and President of the Decatur Country Club in 1972 and 1973. In 2001, Wilson was inducted into the Morgan County Sports Hall of Fame. Archie Wilson died at Decatur General Hospital on April 28, 2007. He had been in the hospital for open heart surgery and one of the nurses mistakenly pierced his lung.8 He was survived by his wife, Sybil, two daughters, Whitney and Heidi, and a son, Wade. In addition to the sources noted in this biography, the author also accessed Wilson's player file and player questionnaire from the National Baseball Hall of Fame, the Encyclopedia of Minor League Baseball, Retrosheet.org, Baseball-Reference.com, Rod Nelson of SABR's Scouts Committee, Bill Lee's Baseball Necrology website, and the SABR Minor Leagues Database, accessed online at Baseball-Reference.com. 1 Archie Wilson player questionnaire at the National Baseball Hall of Fame. 2 Al Wolf, "Bill Essick, Famed Yankee Scout, Dies," Los Angeles Times, October 13, 1951: B1. 3 Ernest Mehl, "Joe Kuhel and Clark Griffith Eye Archie Wilson in Warm-Up," Kansas City Star, April 10, 1949: 23. 4 Cy Kritzer, "Hurry Call to Yanks Caps Big Year for Bisons' Surprise Star, Wilson," The Sporting News, September 26, 1951: 26. 5 Associated Press, "Archie Wilson To Wed," Boston Herald, September 19, 1951: 16. 6 Mark Edwards, "Wilson Had Deep Love for Baseball," Decatur Daily, May 1, 2007. 8 Author interview with Sybil Wilson on October 20, 2016.